The English language has an abundance of words that all imply a light brownish-gray color. Different designers frequently use different words for the same color, or the same word for very different colors. For purposes of stylistic discussion they all behave about the same — you won’t find any set of circumstances where a “tan” suit would be appropriate but “khaki” wouldn’t be. Tan refers to light, predominantly brown shades. Dun refers to a darker brown than tan, sometimes with a greenish tint. Khaki is the most dominantly yellow shade of the related colors, with little brown or gray. Taupe is a darker color with gray tones as well as brown. These are, however, only general guidelines, and every store or designer will have a slightly different take on each color. It’s not impossible to see other terms as well — just remember that, from a stylistic standpoint, they all follow the same rules. Which one to purchase will be a matter of taste, complexion, and budget. Light colors like tan are not as formal as their darker counterparts. Brown suits in general have been a historically informal choice, and have only recently been embraced as business-wear by men looking to break-up the monotony of dark color in their wardrobe. The lighter versions are still considered purely social wear or seasonal wear by those who adhere to strict dress rules. Lighter color suits are also associated with spring and summer, their lighter shades signifying the lightness of the season. Trying to wear a light colored suit in New York City during December not only invites odd looks but opens a man up to the impracticality of keeping it clean from muddy slush. Light colored suits are best for dry & warm weather. As a result, tan suits are usually considered business-casual wear. They may well be appropriate attire for daily work at more relaxed offices, but will not serve at formal meetings or serious occasions. These lighter suits shine best when worn for social and relaxed occasions — as poisonous as the term “leisure suit” has become, with its brightly-colored polyester associations, that’s exactly what most light brown/yellow/gray suits are made for. 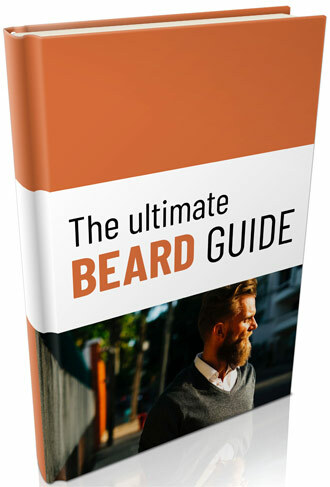 They’re a relaxed choice for men who prefer to appear well-dressed even during their personal time. Patterning may be used to make the suit still more casual. Both stripes and checks are common in light brown suits, including subdued plaids of varying earth-tones. Light-colored tan suits are often used as comfortable summer wear, and tend to be made from lighter fabrics with lighter construction in the shoulders and perhaps even unlined. Both cotton and linen are common, in varying weaves and usually in reasonably thin cloth. Some of these suits can be constructed without dyes, using the natural color of the thread to create a light tan. Others will be dyed further for a deeper color, or create a pattern from threads of multiple colors woven together. Textured cloths like tweed and corduroy are popular for their relaxed appearance and visually “busy” forms. Wool suits can be thicker and richer-looking than their cotton or linen counterparts. They hang in a flatter drape with a little more visual weight, and can add to a man’s bulk as well. In tans they tend toward the yellowish-brown of camelhair, a traditionally casual look. Camelhair jackets are rarely made from the hair of actual camels, which tends to be uncomfortably coarse; when it is a blend of softer wools is almost always used, dyed to achieve the same color. Some natural wools also have their own light brown coloring, and can be used un-dyed in suit construction. 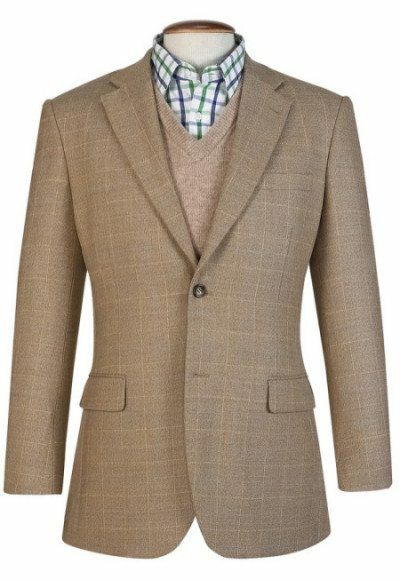 Khaki or tan suits can be fitted as close or as loose as the wearer pleases. Lighter fabrics, especially linens, can be prone to wrinkling if they are improperly fitted, however — a loose suit will billow and fold, while a too-tight fit causes the material to bunch up in unattractive ripples. A well-measured suit still needs to sit comfortably at all points without constricting movement or flapping loosely. In fact it is worth pointing out that of all suit colors, the light browns, tans, and khakis are the least forgiving when it comes to fit as they will readily show the shadows and creases associated with bad drape and hang. So if this suit isn’t custom, make sure it fits well off the rack and take it to a tailor for final adjustment! As a casual garment, a light brown suit allows for numerous stylistic changes. Flourishes that would be considered too “busy” for the boardroom are appropriate on a suit worn during leisure time. A smaller “ticket pocket” above the normal front pockets gives the front of the suit a busier appearance, as does a boutonnière. Nearly any light or pastel color will work as a pocket square, and can be folded as extravagantly as a man pleases. Even rustic touches like leather elbow pads are not out of place on a casual tan suit although this final touch regulates the suit to non-business wear. Tan, dun, and the other light shades are usefully “neutral” colors — they have no natural antecedents or opposites on the color wheel. There are really only two ways to clash badly with a khaki or tan: wearing very bold colors that overpower the restrained suit, or wearing colors that are similar but not quite exact matches. Pure black and bright colors look particularly odd with the casual light browns, and should be avoided. Any very stark shift from one color to another is going to look odd with tans — plan on a gently-gradated appearance full of neighboring colors rather than one based on attractive contrast if you’re going to make light brown a part of your outfit. The other key to matching your tan suits well is to bring out the underlying colors of the suit. Some tans are very heavily brown, while others have gray, yellow, or even olive green undertones. These usually go unnoticed, but can be emphasized by the other pieces in your outfit. Yellow striping in a tie can bring out the yellow of a khaki suit, for example, or a spring green shirt under an olive-tinted brown suit can make the entire ensemble appear very carefully-coordinated. The opposite is also true, of course — if you wear a tan suit with faint yellow undertones and wear a light purple shirt or tie, you risk looking like an Easter egg. Be sure to keep the dominant tones of your shirt and tie collections in mind when you buy a tan suit, and avoid anything with a contributing color that’s going to clash badly. Light brown, tan, khaki, and taupe suits are informal wear when compared with their darker colored brethren. They may be appropriate for some offices, but in general they are meant for days out, parties, and social engagements. A man who enjoys dressing up to suit-and-tie standards for such occasions has a regular use for tan suits, especially when the season calls for something lighter than grey or navy. Teachers may also find it makes a useful gap between professional dress and not looking like “the man” to students, though the latter may be a hopeless endeavor no matter what you wear. If you only wear suits as a business matter and prefer a more casual standard for your personal life, you may not need a light brown suit in your closet. It could serve as an occasional outfit for work-related parties, particularly in the summer, but the odds are that you’d be able to find something else to work just as well. 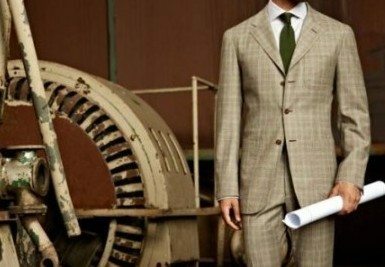 The tan suit is ideal for the man looking to expand his dress wardrobe without adding yet another piece of business-formal wear that looks overdressed in casual company.